Oh dear, Calamity Johann. After her ‘no such thing as something for nothing’ derision of univeralism, hapless Johann Lamont has hit a new low with her worst FMQs performance yet. See her Wee Things comments (here). “Johann Lamont had it on a plate yesterday. Bank of England governor Mark Carney had teed things up exquisitely for her with a speech on how a currency union with sterling would force an independent Scotland to “cede sovereignty” to London, a phrase virtually hand-crafted for dinging off Alex Salmond’s bonce.” Alas no. Severin Carrell in the Guardian reported: “Promising the phrase would be repeatedly used against Lamont over the next weeks and months, Salmond’s spokesman said her words “betray the utter poverty of vision that Labour have [for Scotland]; it’s going to be a very, very, powerful argument for us in the next few months … it almost beggars belief”. It is frankly astonishing that she derides childcare as something meaningless. This – as much as her own goal – will haunt her. But the debate as moved swiftly to how if at all possible Lamont could be replaced, quickly. Early suggestions include five options: her Deputy, the equally gaff-prone Anas Sarwar; her leadership opponent, the likeable but unfortunately forgettable Ken Macintosh (aka The Third Candidate); Kezia Dugdale; the combative but semi-detached Tom Harris MP, and, a surprise early front-runner, Wilson from the hit film Castaway. 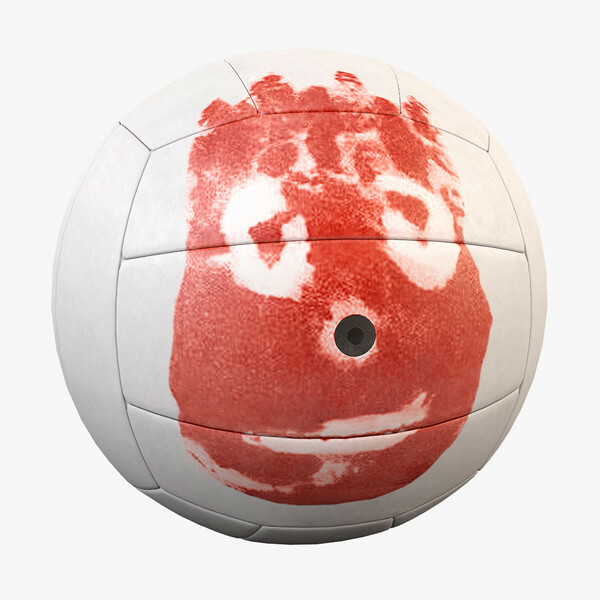 Wilson, the volley ball, has no parliamentary experience but would have, in his favour a deeper grasp of social policy than the other candidates and could produce a ‘bounce effect’. Our early soundings suggest this surprise move could unsettle opponents and is certainly worthy of serious consideration by the party. Yes indeed, Mrs Lamont’s bizarre performance evinced the cognitive awareness of a lobotomised fruit fly and the political acumen of a cold mince pie. Even I felt embarrassed for her. I agree therefore that Wilson may indeed be leading the race, given his enviable gaff-free record, he is guaranteed not to put his foot in it (especially since he has none). Mike – Carney stated quite clearly when asked to explain the difficulties he ‘spoke’ of in a currency Union answered in respect to ‘difficulties’; No, no I didn’t (speak of any difficulties). Carney sees no difficulties for the Bank of England in a Sterling currency union. The second myth is the power of the ‘UK Treasury’ in future negotiations over Sterling when the UK Treasury has stated it can only guarantee UK Government bonds and loans made prior to a ‘Yes’ vote. The reason for this is constitutional. On a Yes vote the only two parliaments who can negotiate the end of the Union are the Parliaments of Scotland and England as original signatories of the 1706 Treaty. The UK Parliament has no negotiating rights in its own demise. On a Yes vote the Parliament of England and Wales will need to be recalled from its temporary suspension. You then have two sovereign parliaments once more, with the UK Parliament reduced to an administrative cipher until its formal termination in March 2016. It is little wonder the ‘No’ side do not wish to address constitutional issues as they undermine many of their claims for the ‘UK’ parliament as I investigated on my own blog. Surely Labour wouldn’t put Sarwar or any other of their Westminster MP’s in charge of Labour in Scotland ? It would be too much of a gift to appoint an MP as head, it has to be an MSP who is elected to Holyrood otherwise their credibility is completely shot to pieces. Absolutely tf.This would highlight the undemocratic state that governs Scotland at present.They might as well appoint David Cameron as the head of Labour in Scotland because he would be singing from the same hymn sheet anyway. I would be so upset if Wilson stood for the NO,s . I really liked Wilson although I do think he could do a much better job than wee Johann ! It’s all becoming like a comedy act , at First Ministers Questions . I hope they don’t replace her as she is an absolute gift to the YES campaign !! She’s just comedy gold, FMQ’s my fav program of the week. I’m surprised she has room to fit BOTH feet into her nippit wee gob ! Johann would have gotten nowhere with that tack either. Did it not occur to the opposition that the UK has some experience in that department? EU anyone? A prime example of the ‘UK’ ceding sovereignty. A currency union is no different, the devil is in the detail of any bargain struck and what and how much control is ceded. I may be on the fence myself about currency and certainly I’d prefer our own eventually, but I believe Scotland has way more than enough bargaining chips to strike a very reasonable deal on any Sterling zone agreement. That’s unless an rUK throws the baby out with the bathwater, but I think that is a really unlikely scenario. As for Johann? What goes round, comes round I’m afraid. Had she spent more of her time actually practicing politics rather than hurling playground abuse on a weekly basis, perhaps her attempt at going ‘off script’ wouldn’t have backfired so disastrously? Richly deserved pelters for Ms Lamont’s own Subway moment. 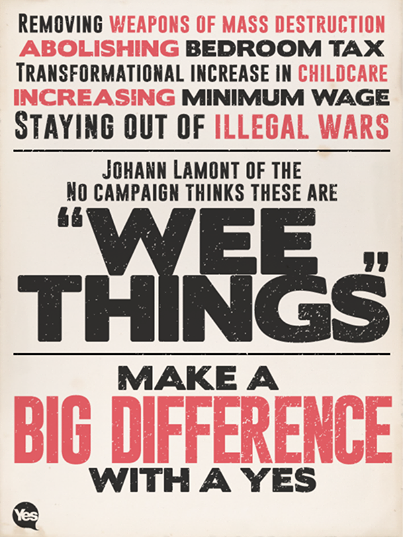 ‘Wee things’, remember that on September 18th. Of course from London, those astute class submarines are far away. Of course, this is Johann muddling Labour’s snappy new soundbite, that they have an “idea bigger than independence”. It was trotted out by Anas Sarwar at the Greenock tv debate, and Alex Rowley in his by-election speech. I suspect they may have to reconsider after yesterday! I’ve never heard a bad or misplaced word come out of Wilson. He never seems to be deflated by life’s events. Always up for a game. Potentially a great political leader. Perhaps Helen Liddell,oh sorry,Baroness Liddell of Coatdyke,could renounce her title and make a comeback to live amongst the proles. O/T. RE BBC Radio Scotland Morning Call:- This week During debate on The Pound heard Louise White refer to YES supporters as “DIEHARDS”…..Louise was talking to Brian Taylor. Could her description of those political item as ‘wee things’ perhaps have been a biological description? Bella and this story were mentioned this morning on Ken McDonald show this morning . However the guests thought that it was just a slip of the tongue ! They did mention her other slips of the tongue too though !